Kids are hungry. I have nothing “planned” for dinner and needed to whip up something fast. I had leftover ziti pasta and marinara sauce from the night before but I knew they wouldn’t go for that meal again. I tried, I did.. Kids: Mom, whats for dinner? Me: hmm, how about pasta from last night? Kids: We’re not in the mood for that. What can I say? My family is spoiled. I can’t blame them, I personally am not a fan of leftover pasta. The textures change.. But I had a LOT of pasta leftover and I didn’t want it to go to waste. I love getting good deals and making something out of nothing. So I play chopped at home and I used to do the same thing in the restaurant. Customers would say, What’s on the menu for tomorrow? I never knew until the next morning when I walked in to the market, looked at all the gorgeous produce and got inspired. Now in my kitchen, I don’t have this market full of produce for inspiration. I have leftover pasta,Hungry kids and time ticking away. So I look in the fridge. OK, I have eggs, ricotta cheese & some mozzarella. Fresh basil in the backyard and Viola it comes to me.. I can mix all these things up, coat them in panko and have a pasta burger. You will either think this post is genius or insane. I say Genius.. Every single one was devoured with NO leftovers. It was a much better meal than the plain ziti pasta we had the night before. To my leftover pasta, I added 1 cup ricotta cheese, 2 eggs, 1 cup of mozzarella and a handful of fresh basil.. Mixed it all together. Used a cookie scoop to make semi-uniform shaped patties. 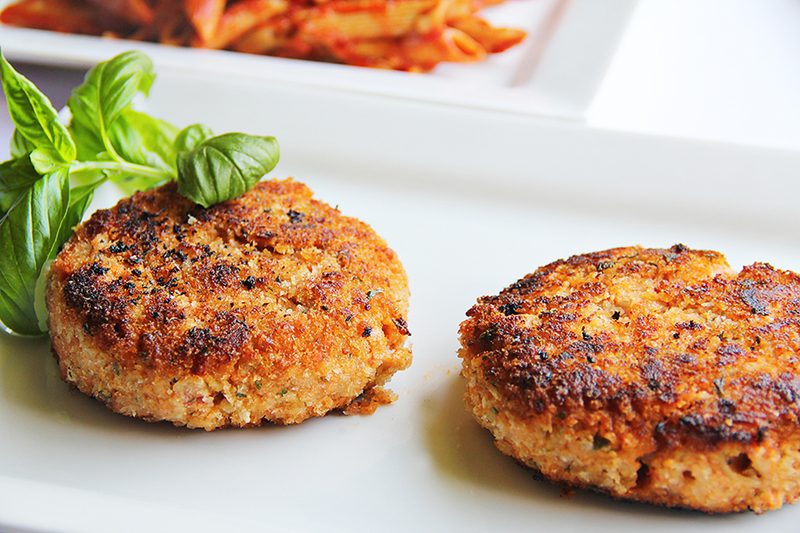 Patted them out like a burger and coated in panko..
P.S. If you haven’t noticed.. 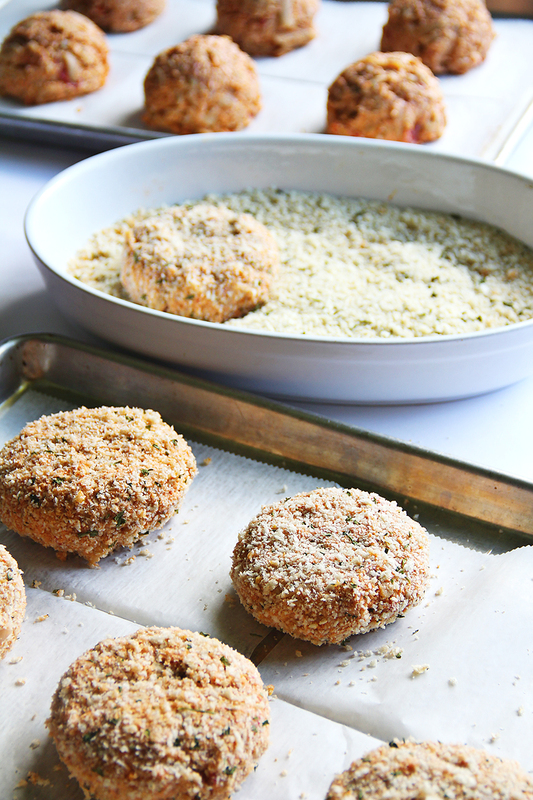 I LOVE panko..
You end up with this crunchy crispy goodness on the outside with a creamy melt in your mouth goodness in the middle. 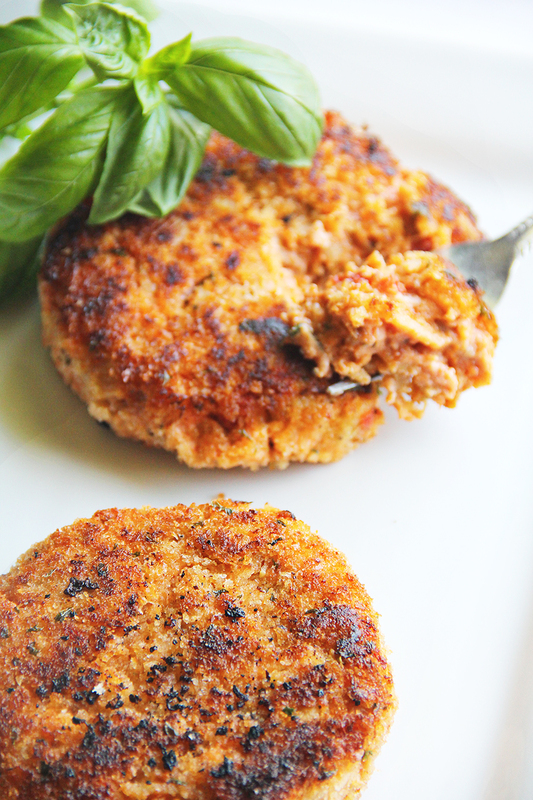 You could really makes these look Elegant by drizzling some marinara sauce on a plate – Eat these on a burger , yes a super high carb meal, but who doesn’t love a spaghetti sandwich. That was not a joke. I was serious. I named this the pasta “burger” because I really don’t like to use the word Patty. It reminds me to much of SpongeBob and with 6 kids, I have made more “crabby Patties” than I would like to admit. It’s kind of like the word “Casserole” – I really don’t like that word since my mother was the casserole queen with chicken surprise every night. I prefer to call them “Bakes” Much sexier than casserole.. Don’t you think? Mix pasta, ricotta, mozzarella, eggs, breadcrumbs & basil. 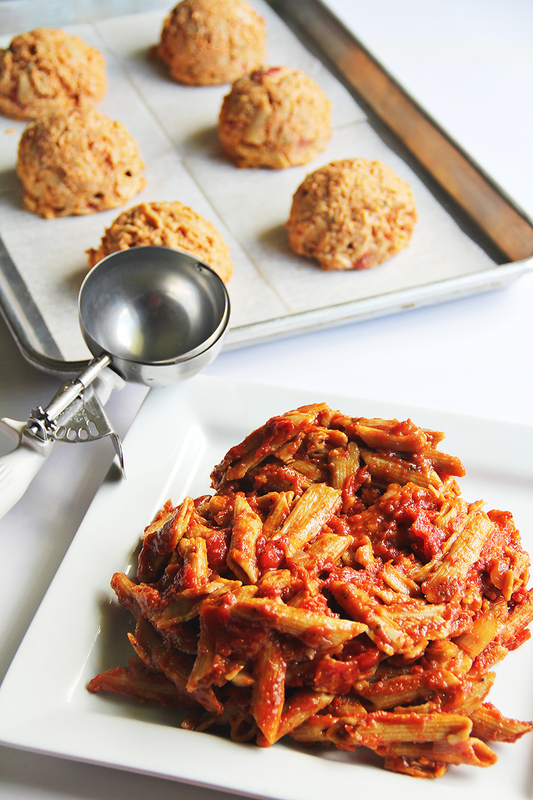 Using a cookie scoop form into balls. 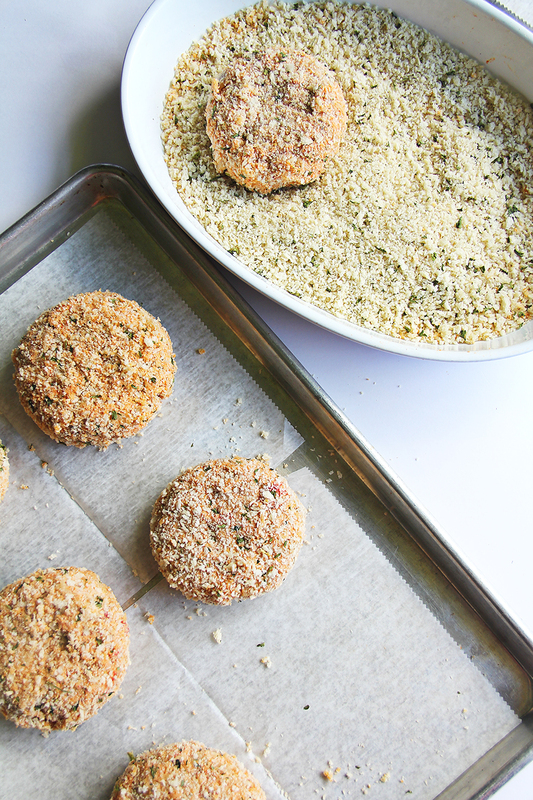 Pat out to a burger shape and coat in panko. Lightly coat the bottom of a pan with olive oil & fry 3-4 min until brown. Allow to drain on a paper towel. I ALWAYS, ALWAYS, ALWAYS have Panko & vegetable stock in the pantry and eggs & cheese in the fridge. 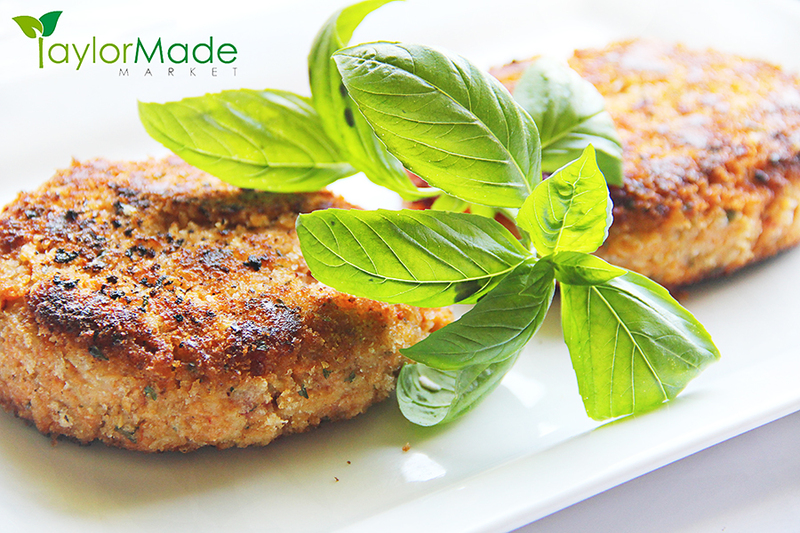 You can make just about anything into a Leftover Makeover dish by adding egg and frying or baking in panko.. SERIOUSLY.. I’ve done this with soooo many leftovers..
Stale Cookies – Grind into crumbs in a food processor – mix with butter and use as a base for pies or cheesecake or use as a topping for ice cream, yogurt, Parfaits. Dip pretzels in chocolate & then in cookie crumbs. Leftover Fruit Salad? add pineapple juice or coconut milk and/or yogurt for a chilled fruit soup or smoothie OR Blend fruit salad add egg, sugar & flour and bake into a fruit custard. Leftover BBQ items? Baked Beans, Pulled Pork, Ribs, BBQ Chicken, Corn on the Cob, Baked Potato all taste fantastic in a soup together. Just add a can of tomatoes, chicken stock & BBQ sauce OR omit stock add cheddar cheese + eggs and pour into a casserole dish. Top with a corn muffin topping and bake. Leftover Chicken could be its own post – Depending on what type of chicken & how it was prepared you can make 100’s of dishes. Using leftovers is the best way to save time & money in the kitchen. Wasting food is not an option in our house. Try using up some leftovers in a creative dish. 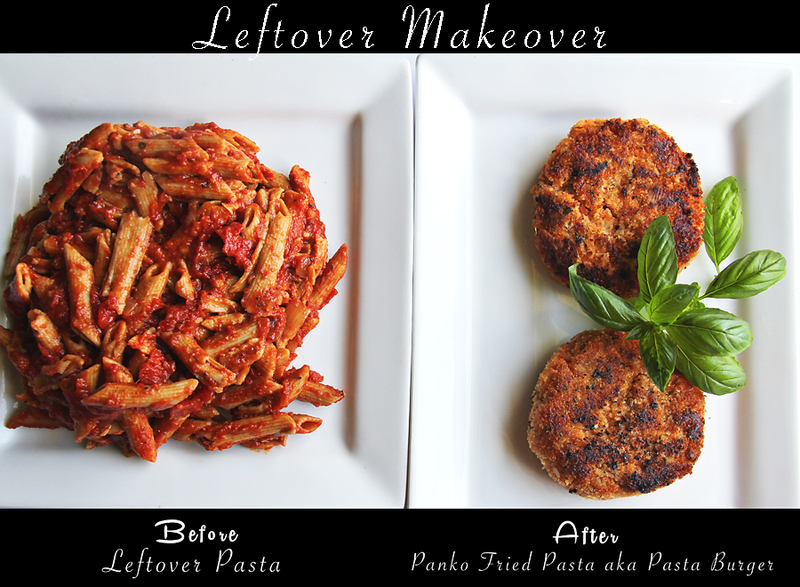 Share your leftover makeover dishes or ideas in the comments, I would love to hear them. Have leftovers and no idea what to do with it? EMAIL me – I would be happy to help.